17 He made the menorah of pure gold. He made the menorah—its base and its shaft—of hammered work; its cups, calyxes, and petals were of one piece with it. The menorah, made of “pure gold,” was lit with pure olive oil and gave off a radiant light. The light of the menorah is symbolic of the Jewish Nation’s duty to spread the light of Torah and God’s will. The pure gold and olive oil are reflective of the pure intentions necessary to influence the nations of the world for the sake of Heaven. Today, the menorah is the official symbol of the State of Israel, which represents the eternity of the Jewish People. 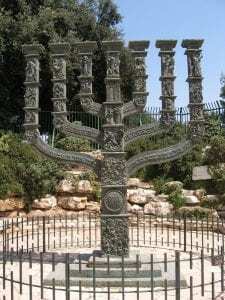 The bronze menorah, located across from the Knesset, Israel’s parliament in Yerushalayim, was modeled after the menorah of the Temple. The six side branches are engraved with depictions of events from the Bible, as well as the Jews in exile. The center branch of this impressive menorah tells the story of the return to Eretz Yisrael, up until the establishment of the State of Israel. Now that the People of Israel have returned home, they can again work together to spread light to the rest of the world. I didn't know that about the Menorah. I had thought it was part of a temple ritual, and reading Exodus have been aware of looking for any reference to the Menorah and why and when it is used. Can someone tell me why acacia was used so much. Was it the only tree available for use, or is there something special about the tree/wood?